Company Advances | McWane, Inc.
McWane Ductile has added a new calculator to the Ductile Iron Pipe Industry leading Pocket Engineer. The new HDD (Horizontal Directional Drill calculator will help utilities and engineers specify McWane Ductile Iron Pipe for the HDD applications. Check it out today. Special thanks to Ken Rickvalsky for all his work on this project. Tyler Union recently worked with a customer on a job in Bentleyville, Pennsylvania that required six 30” FLG Tees with a 16” Side Outlet. This is the first time Tyler Union had produced this size, but with the ability to do short cycle tooling at the IMF Side Floor, they were able to fill this order for West View Water Authority. We are pleased to announce the appointment of Scott D. Willis as the new Chief Executive Officer of Zinwave, effective January 4, 2016. Ian Sugarbroad will step down from his current role on January 4, but will work closely with Scott on a full-time basis for several months to facilitate the transition of his responsibilities. During this period he will move to the role of Vice-Chairman of Zinwave and will remain a member of the Zinwave executive team. Once the transition is complete, Ian will report to Key Foster in a special advisory role where he will provide input on a wide range of strategic, technical, and operational matters that relate both to Zinwave and to McWane Technology Group. This role will enable Ian to take his first step toward his long-term plan to retire to Florida with his wife, Dominique. Scott joins us from Goodman Networks, where he was Executive Vice President, Chief Sales and Marketing Officer. He brings a wealth of experience, knowledge, and relationships developed over his 30-year career in the telecommunications industry. Scott previously worked for Ericsson, Nokia, BellSouth, Sprint, and several smaller global corporations in the communications field. Scott has led a number of large global businesses over the course of his extensive career. He is recognized as a strong sales and marketing executive with a proven track record in market-leading sales growth. He has extensive general management experience setting strategic direction, confecting corporate alliances, and overseeing complex operations for both large and small organizations. He also has built and grown new businesses to significant scale. We are confident that Scott’s leadership capabilities and experience in our target market segments (operator, neutral host, and enterprise) will help Zinwave seize the significant growth opportunities that are within our grasp. Scott graduated from the University of Oklahoma with a bachelor’s degree in finance, received his MBA from Wake Forest University, and received continuing executive education certificates from the graduate schools of business at Stanford and Columbia. Scott will be based in Dallas, TX, where he lives with his wife (Kelley), daughter (Savannah), and son (Chance). We are excited for Scott to join the Zinwave and the McWane family of companies. We are confident he will lead the organization to achieve the ambitious goals that we have outlined for the business. Please join us in welcoming Scott to the team. Zhengwei (Joe) Zhou, Tyler XianXian foundry manager, speaks to approximately 20 Chinese dignitaries about recent improvements through a new greensand molding line, baghouses, and building air supply system and new M1 greensand molding line and electric furnaces. Tyler XianXian was asked by the local mayor to showcase the new greensand molding line (M1) and building air supply system to a group of Chinese dignitaries. 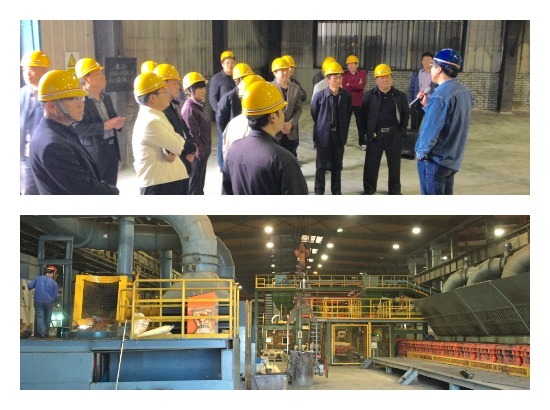 Approximately 20 officials, including local and area mayors, vice-mayors, the Director of the Environmental Protection Bureau, stopped by Tyler XianXian to see the new M1 molding line, baghouses, and electric furnaces. The M1 molding line is the first phase of a two-phased project with the second line, M2, currently under construction. M2 has a completion date scheduled for mid-December 2015. The total capital for the M1, M2, and air supply system is approximately $5 million or 30 million RMB. The building air supply system will distribute approximately 700,000 cubic feet per minute of fresh air throughout the main foundry building. The M1 molding line has a production rate of 8 tons per day at 15 molds per hour, while the M2 molding line will have a production rate of 30 tons per day at 50 molds per hour. At McWane, we encourage our team members to constantly evaluate their jobs to determine if they can be done more efficiently or safer. 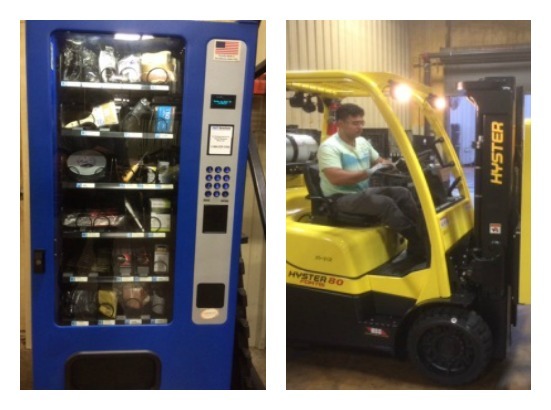 At Tyler Couplings in Marshfield, Missouri, they also have an incentive program to reward team members that do just that. 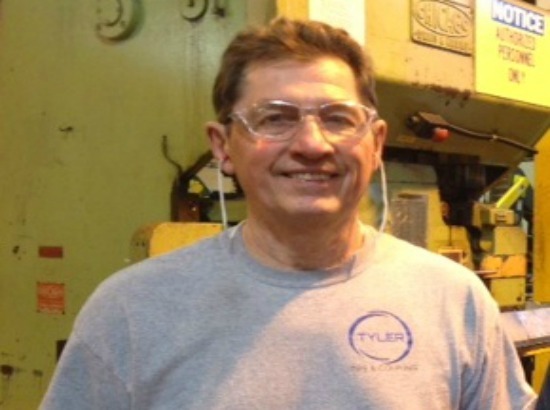 Chet Johnson in the Tool & Die Department was recently awarded a $50 gift card for inventing a way to more easily replace the eyeletter needles. Eyeletter needles would break and the Tool & Die guys would have to spend time removing them from the machine by torching the broken needles off and then silver soldering in new ones. Chet created and built a threaded design that can be taken apart while in the machine and replaced with a new needle. The result is a 30 minute time savings with no hot work required! Great job, Chet! We thank you so much for your innovative thinking!